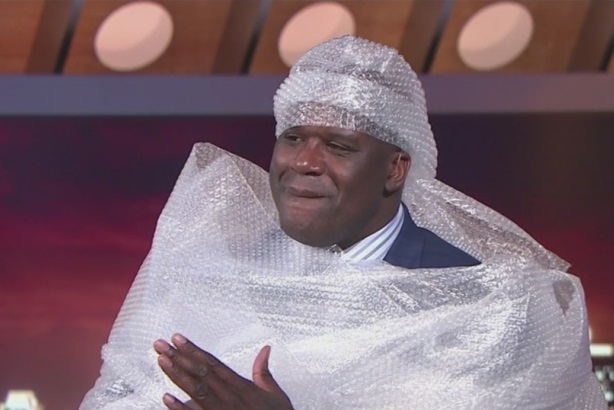 After Shaq fell on-air, Coyne saw an opportunity for client Bubble Wrap. NEW YORK: When Coyne PR saw former NBA star Shaquille O’Neal’s on-air fall last week, the firm quickly connected the dots for its client Bubble Wrap by sending the basketball legend enough of the product to protect his entire body. The seven-foot-one-inch former athlete, now serving as a TV analyst, took a tumble on the set of TNT’s Inside the NBA last Wednesday during the Rockets vs. Clippers NBA playoff game. The Internet exploded with jokes about the incident. O’Neal himself went along with it, tweeting that he’d pay $500 to whoever made the best meme of his fall. Kyle Ragonese, senior account executive at Coyne PR who works on the Bubble Wrap account, said when the team saw O’Neal fall, it was "one of those ‘aha moments.’"
"Bubble Wrap is known for protection and Shaq is a fun-loving athlete, so the situation lent itself to that kind of idea popping up," he said. After coming up with the concept, Coyne pitched the plan to Bubble Wrap parent company Sealed Air to make sure they were aligned with it, said Ragonese. Next, the firm reached out to the producers at TNT to tell them about the Shaq-sized Bubble Wrap idea, and they loved it, he said. TNT asked Coyne to overnight Bubble Wrap to the set in Atlanta, so the agency sent two massive bales, along with a letter to O’Neal telling him to stay safe. The letter, signed by Sealed Air business manager David Weiss, told O’Neal the company is all about protection, and "while you made a career out of clearing out the paint, we want to make sure you stay safe for the rest of the NBA post-season with your very own Shaq-sized Bubble Wrap cushioning." O’Neal put on the Bubble Wrap during the show Sunday night, causing frenzy on social media again. In addition to social, the news spread quickly across digital media channels. A number of outlets reported on the Bubble Wrap fun, including Sports Illustrated Online FanSided, ABC World News Now, USA Today, New York Daily News, and SB Nation. Ragonese said Sealed Air is ecstatic "to see Bubble Wrap on a primetime sports broadcast during the NBA playoffs with one of the biggest players in the NBA." While a situation like this tends to have "legs and life of its own," Ragonese said the brand will post updates on its social channels through the week to make sure everyone has seen the story. He added that the key to this process was the firm’s quick turnaround. "It was a well-oiled machine and really fun," said Ragonese. "We turned this around with the offer letter and over-nighting the Bubble Wrap to Atlanta in just half of a work day."